Jim Fellows while employed by the SLO Police Department. UPDATE: Sheriff’s spokesman Tony Cipolla said deputy Jim Fellows is facing a temporary suspension from the department following his trial. The department also detailed its reasons for retaining an officer arrested while on probation. A San Luis Obispo Sheriff deputy was arrested after he was caught driving over 100 mph while intoxicated. Nevertheless, he was not booked into the county jail, no mug shot was taken and even though he was working under the county’s new hire probationary period, he kept his job. On Oct. 8 shortly before midnight, CHP officer Preston Richwine clocked “a loud muscle car” going 102 mph on Los Osos Valley Road. Richwine then made a U-turn and pulled over the blue 1965 Ford Mustang. When Richwine walked up to the window, Jim Fellows handed the CHP officer his license and San Luis Obispo County Deputy Sheriff ID card, according to the incident report. Richwine then asked Fellows to get out of his car and proceeded to remove the revolver Fellows was wearing on his side. “The subject then began to relentlessly apologize for the speeding and related that he was just a ‘car guy’ taking his passenger on a ride and showing off,” according to the incident report. After noticing the smell of alcohol, Richwine asked Fellows if he had been drinking. But Fellows evaded the officer’s questions and attempted to change the subject. After the interview went into a more “cooperative direction,” Richwine asked Fellows to take a breathalyzer test. Fellows blew a .15 on the PAS test, almost double the .08 threshold for driving while intoxicated. Generally, drivers who have a blood alcohol of .15 or higher are booked into the county jail, but Fellows was cited for driving under the influence and released to a friend to take him home. In some cases where the CHP is dealing with multiple calls, such as a Saturday night, officers will cite and release because of logistic concerns, said Lt. Mike Brown. Before going to work for the sheriff’s department about eight weeks ago, Fellows had worked as a San Luis Obispo police officer as part of the Community Action Team. New hires at the sheriff’s department are required to serve a 12 months probationary period in which the sheriff’s department determines if the new hire meets the department’s standards. In most cases, getting arrested for a DUI during the probationary period will result in termination. However, Fellows spent several weeks on paid administrative leave while internal affairs conducted an investigation, sheriff spokesman Tony Cipolla said. He was then released back to work. In California, an enhancement is required to be added to a DUI offense if it is demonstrated that the defendant was driving recklessly on the roadway at more than 20 mph over the speed limit. Richwine clocked Fellows driving 47 mph over the posted speed limit. It will be up to the court to determine if Fellows was driving recklessly. Fellows is slated to be arraigned on Nov. 22 at the San Luis Obispo County courthouse. Did Santa Maria police set a suspect’s house on fire? Many speak of corruption among local officials throughout San Luis Obispo county. Stories like this one with Officer Fellows gives credence to such reports. Guaranteed, if I did this, I’d be in jail right now, not continuing on the payroll. Disgraceful situation, Sheriff Ian Parkinson. I think it’s totally appropriate for the CHiP to go with the cite and release. This keeps him on the road plus, the jail folks don’t need to suddenly find a place to house one of their own (away from the general population). This move saved lots of money and grief and his punishment won’t be any less than yours or mine I’m guessing. His “punishment” was already favorably modified by nature of his car not being impounded, him not being transported to jail and his mug shot not taken, as any ordinary citizen who was driving 102mph in a 55mph zone, drunk over .15% and carrying a gun would have been subjected to. This stinks of LE favoritism. To add insult to injury, all of the corruption, cronyism, incompetence, fraud, waste and abuse that is out-of-control in all levels of government is being enabled, aided and abetted by the Organized-Crime Affiliated bosses of the Public Sector Unions. You sound like one of those people, often feeding at the trough, who keep telling us,”That’s why we need to pay public sector people so much, so we get the best and the brightest”, We see what it got us here, Officer Fellows, a public sector employee with a total disregard to public safety, ironically enough employed by a agency with the motto “To Protect and Serve”, we just didn’t whom was being protected and who was being served, but we do now, thanks to Sheriff Parkinson’s do nothing punishment. This seems Like Allot of money, Who wants to Risk your life as DPINC, The point of this is the system is Broken, The Message for the common man , Don’t do it .. This officer will get away with this … So what’s the answer ? They have a hard time finding people to hire..
It’s sad its gotten to this point. With Fellows attitude of “I’m above the law”, one has to wonder how many other times he has broken the law and not been caught, especially since he has this attitude of no matter what I do or what laws I break, I will not lose my job or suffer any real consequences. 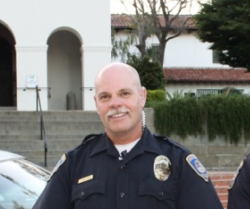 I just want to a very simple question: If this 20 year veteran of the SLO Police Dept has “exemplary” service, why did he quit or retire to take a job at the Sheriff’s Dept. We all know that if he worked at the Police Dept his pay was a higher than what he is making as a Sheriff’s Deputy. This story about his background and “exemplary” service just isn’t sitting right nor does it smell good. Drinking intoxicated, with a passenger in the car, on Los Osos Valley Valley for a 20 year veteran of SLO Police does not sound like a staple nor responsible law enforcement officer from any Department in this County and certainly becomes a risk. Ian Parkinson, a former Captain with the SLO Police Department does not need to be told that cronyism is something that taxpayers are aware of in our local departments and will not be tolerated. Shame on him to cover for a former buddy! This type of lawlessness from our law enforcers is nothing new and in part all of our fault; we have empowered and emboldened law enforcement in the past to the point where they know they will not be held accountable. But, if by chance they are held accountable? Their past “exemplary” service will more likely than not either lessen their sentence or will be the factor for no punishment at all. I don’t have a voice in this; I’m an ex-con with years of almost daily direct experience with these folks so of course I’m not at all qualified to speak of such things. I’ve experience both the good and the bad with these folks and I can honestly say that most do their jobs with a “public service and protection” mind set but I can also say there is a solid group who do not. Yes, everyone who gets pulled over for DUI for the first time, going 100+mph, should just tell the officer, “Well I’ve never done this before and had a excellent record, so just let me off this time”, it works for the “s[special” people, wonder how that would work for us regular folks. As an ex-con shouldn’t you be a RAIDERS fan?